It is easiest to discuss end-of-life wishes before it becomes a concern. Bring up the subject of Hospice care. Talk to your doctor. Ask questions. Express your personal ideas and preferences. Include your family and loved ones. Then you can make a thoughtful decision. When your doctor refers you, Hospice is covered by Medicare, Medicaid, and most health insurance plans and HMO’s. If you lack adequate insurance or are unable to pay, we will work to find a solution together. You and a doctor can decide when Hospice care is the right choice. You have the right to choose which Hospice services best meet the needs of you and your family. When frequent hospitalizations occur with uncontrolled symptoms. The right care, at the right time. Hospice focuses on the hope that every day will be the best it can be, rather than whether the disease will be cured. 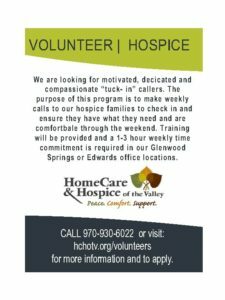 In the end, Hospice of the Valley can make this journey easier. We have many services that can help you and your family.